James is one of seven WSU researchers who received support from the second round of the Commercialization Gap Fund, support that helps researchers get innovations from the lab to the market. Read more about the other grantees here. James decided to pursue academia and racial justice research because she wanted to have an impact. The officer is participating in a “use of force” simulation. In 2009, when James was a graduate student of Professor Bryan Vila’s at WSU Spokane, she led the development of deadly force judgment and decision-making scenarios to investigate the disproportionate number of ethnic and racial minorities shot by police. 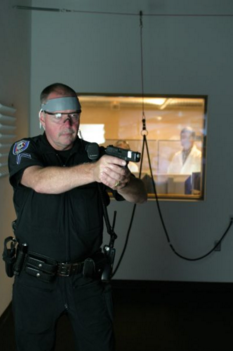 The high-definition video scenarios are displayed in “use of force” simulators, where participants use laser-equipped guns to react to potential threats. Findings from the simulations indicate that biases do exist, but tend to effect officers in complex and unpredictable ways. For example, in the simulator many officers display strong signs of implicit (or subconscious) racial bias, but also display strong signs of “counter bias,” evidenced by a greater hesitancy to shoot minority suspects. These findings attracted the interest of the International Association of Chiefs of Police (IACP). The IACP reached out to James in 2015, asking her to join their research advisory council and develop a Counter Bias Training based on her work. For the past year James has been working with the Office of Commercialization to turn her research findings into training materials. The high-definition video scenarios and “use of force” simulators she used to collect data will now be available to police departments, with the goal of exposing officers to a variety of deadly force judgment and decision making scenarios in which the race of the suspect is not predictably related to whether or not deadly force is required. After completing the simulations, officers would participate in post-scenario debriefs to reflect on their reactions and decision making during the scenarios, bringing any implicit biases to light. In order to get this training to police departments across the country, however, James and her team have to convert their “use of force” simulator into a portable system. Doing so would require funding for some technological development not supported by her research grants. The Commercialization Gap Fund was just what she needed to fill that gap, as well as develop a marketing plan and outreach materials. James received her funding late in the fall of 2015, and is on track to convert the simulator in time for a proposed September 2016 launch of the training to approximately 600 police chiefs, executives, managers, and trainers at the 21st Century Policing Summit, hosted by the Federal Law Enforcement Training Center (FLETC).